Tim Minchin · Tim’ll be appearing in ‘Orange Is The New Brown’, starting 8:30pm Thursday 8th November on Channel 7! Tim’ll be appearing in ‘Orange Is The New Brown’, starting 8:30pm Thursday 8th November on Channel 7! 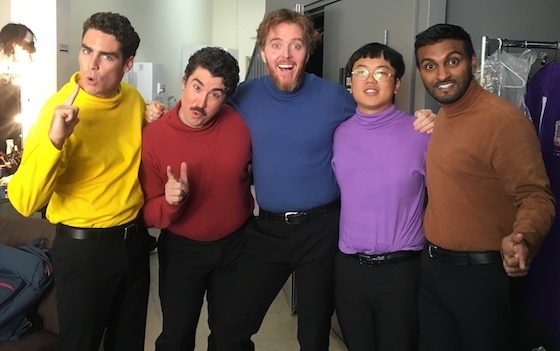 Tim’ll be wiggling into view periodically in Orange Is The New Brown, a hilarious new sketch comedy series from Nazeem Hussain, starting Thursday 8th November at 8:30pm on Channel 7. The series takes a look at race, popular culture, politics and life in contemporary Australia, through fast paced sketches featuring an ensemble cast of Australia’s hottest comedy stars, including Urzila Carlson, Becky Lucas and Matt Okine, plus some big-name cameos. Just watched your two specials on Netflix (ten times so far) and all the videos. Please,please,please come to Hawaii! Please come to the US – BOSTON!!!! Will the show be available online at some point, so that people from European countries (Germany for example) can watch it (legally :P) ? Looks really delightful ! How can we see it in Canada ?